Learn about the animals, birds, plants, rocks and minerals. It doesn't matter if you are a photographer, backpacker, angler, naturalist, hiker, hunter, bird-watcher, there’s always some new experience awaiting you over the next hill, valley, around the bend of a mountain stream or a mile down the road. We’ll see the nest of eagles, red-tailed hawks high in a cottonwood tree, prairie dog mounds dotting a sagebrush flat, and tracks of deer, antelope and elk by a streambed or hiking by a trail. Breathe the clean mountain air that blows through your hair while refreshing yourself in an alpine meadow ablaze with wildflowers. 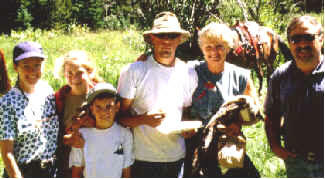 You can watch the wild horses, pronghorn antelope, golden eagles and sage grouse. 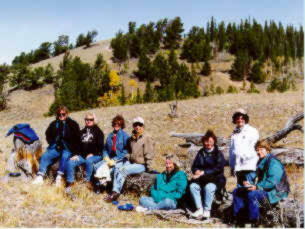 Hike among the limber pines, aspens, junipers of the foothills while looking for mule deer and chipmunks. Visit and study the activities of the riparian areas, home of the beavers, muskrat, great heron, a variety of ducks and other waterfowl You’ll probably see bald eagles and perhaps moose. Elk, blue grouse, gray jays, and yellow bellied marmots will often be seen on our mountain excursions. 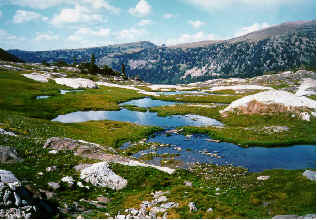 In the windswept passes above timberline, one will likely see pikas, bighorn sheep and pristine lakes filled with cutthroat, brown and brook trout. At night, enjoy the warmth of a campfire and listen to the howl of a coyote or the haunting cry of a great-horned owl, the bugle of a bull elk or the splash of a rainbow trout as it breaks water. Discover the beautiful rocks and rare earth minerals and Indian artifacts while sharing stories and experiences of our ancestors who settled here four generations ago. Then retreat to the hot mineral springs after the day’s trek. Don’t miss the sense of freedom, the smell of sage, unspoiled wilderness and warm hospitality while learning how you can help preserve wildlife habitat and make a difference while contributing responsibly. 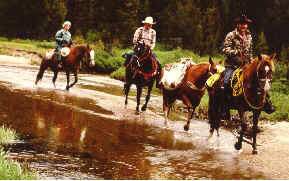 Learn New Skills: orienteering, survival, shooting, fishing, photography, horseback riding, and camping. 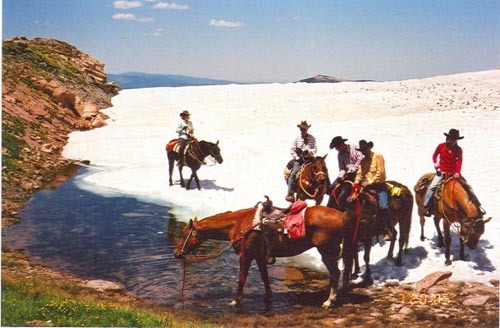 Experience high plains deserts, and mountains while riding through alpine meadows, a blaze of wildflowers, where the eagles soar and where the deer and the antelope really do play. It doesn’t matter if you are a photographer a backpacker, angler, naturalist, hiker, hunter, or bird-watcher, there’s always some new experience awaiting you over the next hill, valley, around the bend of a mountain stream, or a mile down the road. A must for family and friends. 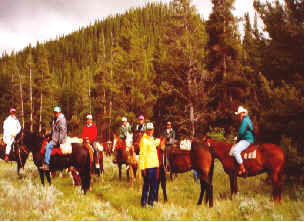 Activities such as rodeos, wood chopping jamboree, float trips, natural hot springs, historical sites and museums are but a few of the things you can add to your vacation. COME JOIN US IN ADVENTURES THAT BRAND MEMORIES! We must enforce a strict 250-pound weight limit to ride our horses. To customize your vacation,groups of 2-4 people are best. Trips include everything except personal gear, sleeping bags and tax. Ask about our three-day trips.